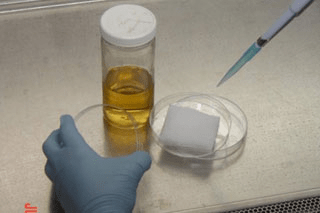 The antimicrobial finish test was developed primarily to determine the percent or log reduction of a target organism when exposed to an antimicrobial that was placed in or on a textile material. The method can also be modified to include different materials, time points, and test organisms. For the Antimicrobial Finish test procedure, test intervals are selected to characterize the time during use that the test material would be effective in significantly reducing microbial counts (generally 0, 24, and sometimes 48 hours). The test is performed with treated and nontreated swatches of the test material. The nontreated swatches serve as a positive control for the test. A test sample is placed into a sterile container or petri dish and inoculated with 1.0 mL of the appropriate test organism suspension at approximately 106 colony-forming units (CFU)/mL. The sample is allowed to sit for the selected time and is then extracted in a neutralizer media which is diluted and plated accordingly. This is repeated for all test intervals using both the treated and nontreated material. Organism recovery from the treated and nontreated material is then compared to determine the log reduction and percent reduction over time. Finally, a neutralization study is completed for each of the test organisms and antimicrobial samples to demonstrate that the media, method, and dilutions used were able to effectively neutralize the active antimicrobial to support acceptable organism recovery. If you have additional questions about Antimicrobial Efficacy testing, or would like to consult with the experts at Nelson Labs, just send us a request or call us at +1 (801) 290-7500.